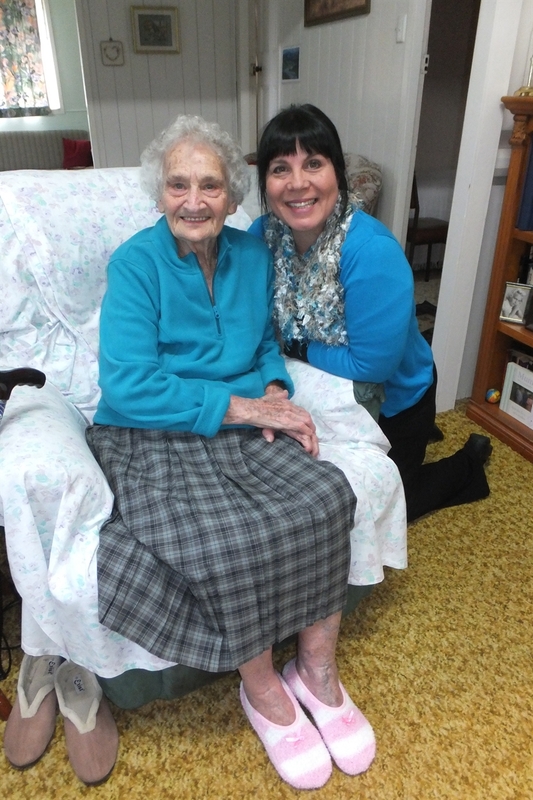 Last week I was over in Queensland as my family celebrated with my Grandma who turned 100. Being over there for a week was very special - and though it was my mum's side of the family celebrating, I was also able to spend time with some of my Dad's family. My grandma is a strong woman who gives credit to her long life to two things – God’s blessing and her willingness to forgive. She sees herself as an ‘ordinary’ person but to her family she is amazing. She has a heart to help others - and one thing that my kids like to remember is that she was still taking communion bread and fresh flowers from her garden to church every week at 95! To me she is home away from home. I used to love walking around her garden with her explaining how to pot, divide and care for all sorts of different plants; she still has a few pots and a small shade house going. Her legacy is far more significant than living for 100 years – her legacy is the encouragement and example that she sets before us all. Even on the day of her birthday she is willing to do things for others instead of having others do things for her! Meanwhile the kids where back at home and I initially thought they would have a quiet holiday week, with not many people around, but their week ended up quite busy with them being the hosts to friends camping in our back yard, going to the movies, and then the last few days they picked up their study routines again. This week I'm sharing a blog post on 10 Things we did as Intentional Parents, you can read it below or click over and read on my blog. As Peter and I look back on our parenting journey – we now have grown and almost grown kids – we see the importance of being intentional. Even before I was married I looked at spheres of my life and said to myself – where to do I want to be and how am I going to get there? These two questions helped me plan action steps. And it is the same with parenting – what do you want your kids to be like – and how are you going to get there. Here are ten things that we’ve done in our family as a part of our intentionality. These ten things aren’t fireproof ways to get morally mature kids, they aren’t guarantees to have friendship with your kids when they are adults or surety that your kids will love and serve Jesus – but they are ten things we’ve done with those things in mind. A yearly WOTB (said: what-bee). Actually this came from a business seminar we went to and it means: Working on the Business. We often get caught up in doing the daily stuff of life that we rarely step back and see the big picture – set the vision, write the goals and determine the processes. We have tried to have a WOTB yearly – a time where we get away from the daily tasks, and focus on what we want for our family and how we are going to get there. We’ve invested in Professional Development. When our family was young we discussed the need for Peter as a Vet to have a certain amount of professional development and he budgeted for the costs of that. We realised that if we were serious that my work was at home, raising our kids, then I too needed professional development (as did Peter as Dad) so we budgeted for the costs of that. It takes time and money to learn how to be a good parent and homemaker. Parenting courses and other reading material, time to network with other mums finding and giving support, and time on the phone to my mum who was my parenting mentor and guide. Intentionally taught Character. I see character as the quality of our response to people and circumstances, based on our moral values. 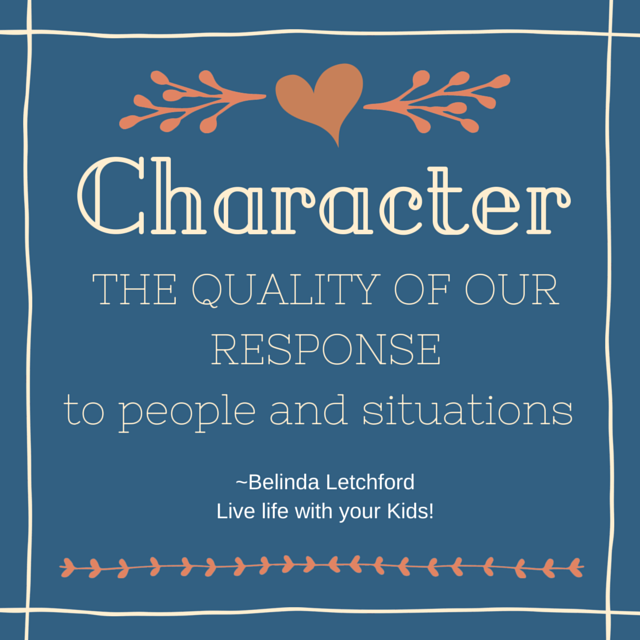 Character is a life skill – how we respond to people and circumstances. Using Character First as my main resource, we intentionally taught our children to connect their actions and attitudes with a moral value. We taught them to be kind and loving in their words, because people and their feelings are important. We taught them to care for their belongings because Daddy worked hard to buy those things, and we need to learn to be responsible for the things we have. Each action or response is tied in with a moral value. Planned Heart training. I would regularly (sometimes weekly, sometimes monthly, sometimes quarterly) look at each individual child and see where their heart is at. Their heart is their beliefs, character, emotions, passions, choices – what’s going on in their life and what do they need to learn. I would then intentionally plan a heart lesson – they may need to learn orderliness, or be reminded of pride vs humility, or see the consequences of their choices. I would also think through the consequences that I could use to help them learn the importance of the lesson I could see they needed. Reminding myself of Bible verses, stories, and natural ramifications meant I was prepared when conflict came into our home. I knew how I was going to handle things. I also reminded myself during this planning time of my kids love language and made sure that I was showing them love. Used my time intentionally. I looked at all that I needed to do – maintain family relationships, look after the home, homeschool the kids, help in the community, learn things myself, and not to mention finding time to relax and refresh myself – so I looked at all that I had to do, and I looked at the hours in my day, and I made time slots for each priority. I also looked at the things that I was doing and looked for opportunities to teach my children something. If I was doing housework – that was a time to teach my children life skills. If I was helping someone out, it was an opportunity for my kids to learn to help others. If I was having my quiet time, it was an opportunity for my kids to learn to have time in their Bibles. I also made time for specific things – when I saw a gift/skill in my children I made time for them to practice that or get lessons to grow in that, when I saw a need, I would arrange my time to address that need. We often complain that the busyness of life just rushes us on, but we need to be intentional about how we spend our time, and when we are, we can meet our priorities. One resource that we highly recommend for senior highschool students and all adults is The Truth Project which is produced by Focus on the Family. It addresses the foundational thinking for each sphere of life. Create specific family time where we can relate to each other. These times have evolved and changed over the years but central to our family life is that we seek time where we can be together. As our children have grown older and have connected with more outside of the home activities it has become even more critical that we have set aside time to connect with each other. Meal times is one of the easiest to be consistent with (we all need to eat) but also the quickest to let go by the by. We can also set aside an afternoon, an evening and regularly plan activities to do together – it doesn’t have to include food! Some families have their children plan these times, others brainstorm ideas together, and sometimes the parents treat the kids to a surprise activity. There is no right or wrong way to do family time – the key is that we do it – regularly. Celebrate and affirm the individual – We mainly do this at Birthdays, but also on major achievements. Our birthday traditions include special food, sometimes a party, no school, no chores (a reality check once adult life and working starts!) We celebrate 10 years old with a unique experience negotiated with each child, and we celebrate 18th with a community celebration as they enter adult years – the highlight of this celebration are several gifts which celebrate who they are as individuals, and reflect their passions and talents. Each year I like to write each child a letter, reflecting my heart for them – I affirm my love for them, sometimes I record their growth and I leave them with my mother-heart prayer for them for the coming year. This is private, and they have rarely shared those letters with anyone. Create opportunity for our children to be a part of the body of Christ. Our children are a part of the family of God and as such we have tried to get them involved – they have helped us on rosters – taking up the offering, picking up communion cups, serving morning tea, cleaning. As soon as appropriate they have been on the roster themselves to read the scriptures, greet at the door or give a kids’ talk. When I organise food to help others out, they help me cook and deliver. When I meet with someone who is distressed, they join me in prayer first and then disappear giving that person time and space in our home. When we drive to church they think about who they can be a blessing to instead of just wondering what they can get out of it. I want the body of Christ to be my children’s family – and to that end I get them to be a part of it. Tell God Stories. We don’t do this enough – but I believe it telling of the good things that God has done – or the modern way of saying it is: giving testimonies. We often see testimonies as our ‘salvation story’ and yet God does more for us – our salvation was just the beginning. So often we are asked to pray and we don’t celebrate the answer (maybe we don’t even expect one) – but God does answer prayer, God does speak to our hearts, He does intervene in our lives; He is our provider, our protector, our strength and wisdom – when we celebrate and make known how he is involved in our life we build up our faith and the faith of those who are listening. I have used a scrapbook to document the good things God has done – but we can keep a memory box of representative memorabilia. But regardless of how we keep the story – it must be told to our kids. These ten things obviously reflect the things that we want for our children – your ten things may differ. But the key is to ask yourself what do you want for your family, and how are you going to get there? Make your Family Room your Learning Room, looking at how we set up our learning room. My Favourite Homeschool Curriculum Choices - looking at my favourite curriculum over the years. and something random from the archives: Kids Signatures - even in this digital world, we still need signatures. Restoring the Heart, Mind and Soul of Christmas Do your Christmas celebrations line up with what you believe? Do your celebrations help your children learn more about Jesus? This e-book is based on a workshop I held for a couple of years to help families see that Christmas can be a significant tradition in our family life. If we are intentional about how our family celebrates we have the opportunity to use this time to teach our children about Jesus, and his love for each one of us.